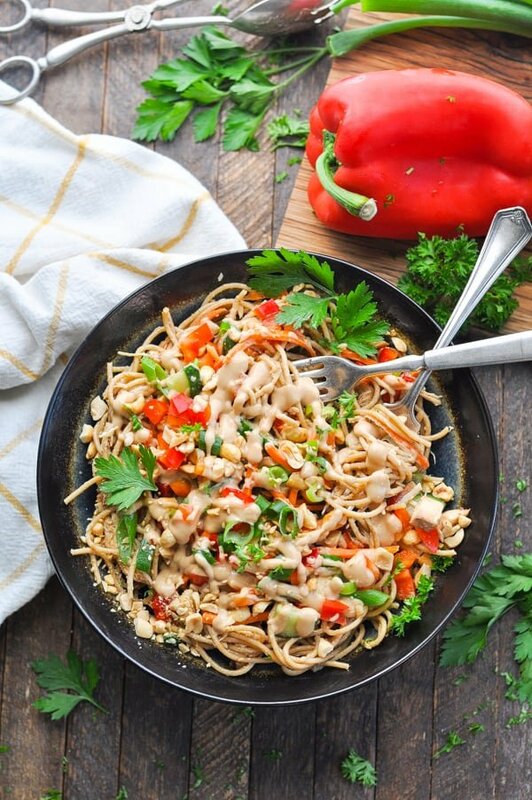 These Cold Peanut Sesame Noodles with chicken are an easy and healthy make-ahead dinner or lunch recipe that the whole family will love! This healthy dish definitely ranks on my family’s Top 10 list of Favorite Dinners. 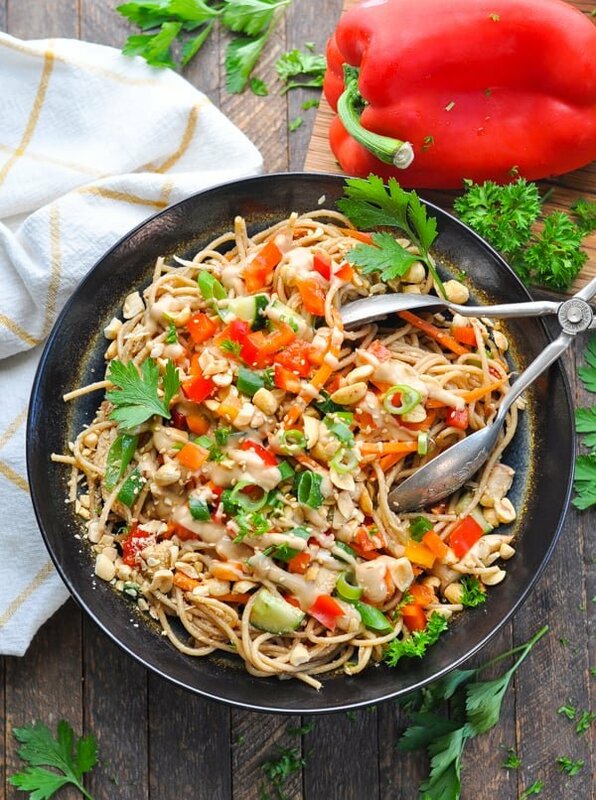 It’s rare when I find one meal that every single child and adult in our house loves, and these Cold Peanut Sesame Noodles are one of those gems! Heads up! 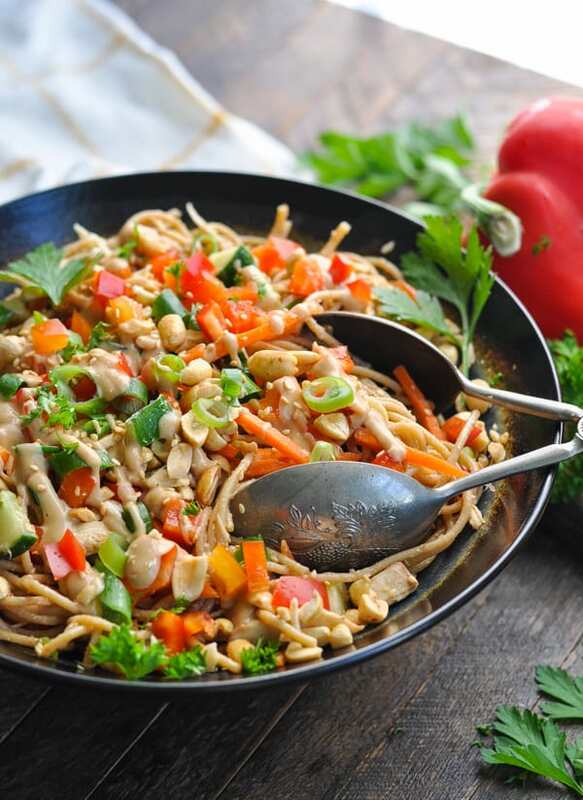 This recipe for Cold Peanut Sesame Noodles was originally published in July, 2013. The photos were updated in August, 2018. 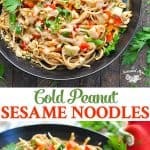 I have loved cold sesame noodles for as long as I can remember…my mom even used to bring them home from the grocery store deli as a special lunch treat! I spent years perfecting my own recipe (the right amount of toasted sesame oil is key), and this is a true winner. It’s especially perfect in the warm summer months when a hot pasta dish is not very appealing. With loads of veggies, whole grains, lean protein and healthy fats, it’s an entire meal in one bowl! 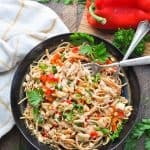 This easy dinner recipe just goes to show that we should never assume that our children will not like a meal before we even offer it! The first time I served this, Gibbs marched up to the dinner table, said “I don’t want that for dinner,” and asked for mac and cheese. We told him that he could eat the dinner that was served, or he could go without food for the rest of the evening. Guess what? He sat down and finished three helpings of the cold peanut sesame noodles! This dish is best when it’s refrigerated for at least an hour before serving, so make it in the morning or during your child’s nap and you’ll be very happy at the end of the day! Is someone in your house allergic to peanuts? 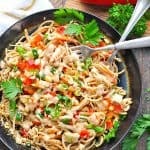 I’ve made the sesame noodles using almond butter and chopped almonds instead of the peanuts and it still tastes great! Vegetarians? Just leave out the chicken! You can also vary the amounts of each vegetable to make sure that you have the most of what your family loves. Have fun with the recipe and enjoy! 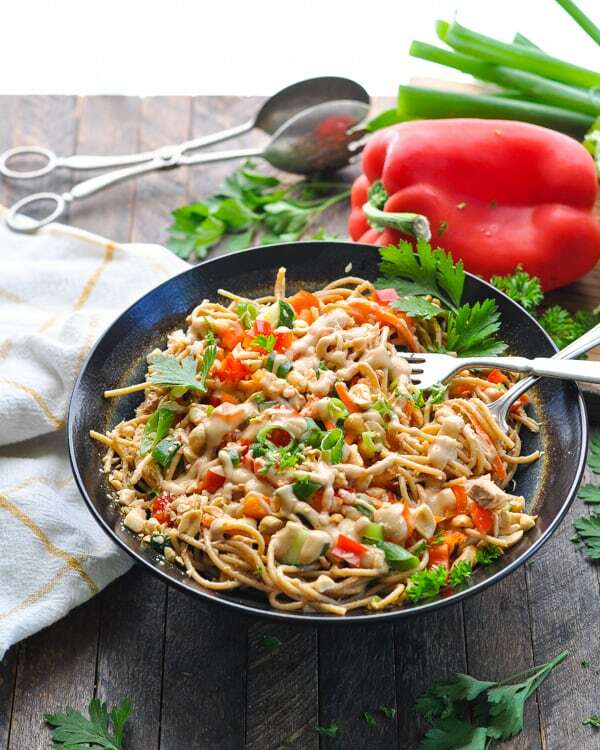 If you’ve tried these Cold Peanut Sesame Noodles or any other recipe on The Seasoned Mom, then don’t forget to rate the recipe and leave me a comment below! You can follow me on Facebook, on Instagram, on Pinterest, and on Twitter! For the sauce, whisk all ingredients together in a small bowl until smooth. Set aside. For the salad, combine all ingredients (except for the peanuts) in a large bowl. Pour HALF of the sauce over top and toss to coat. Reserve remaining sauce for garnish. Cover and refrigerate until ready to serve. 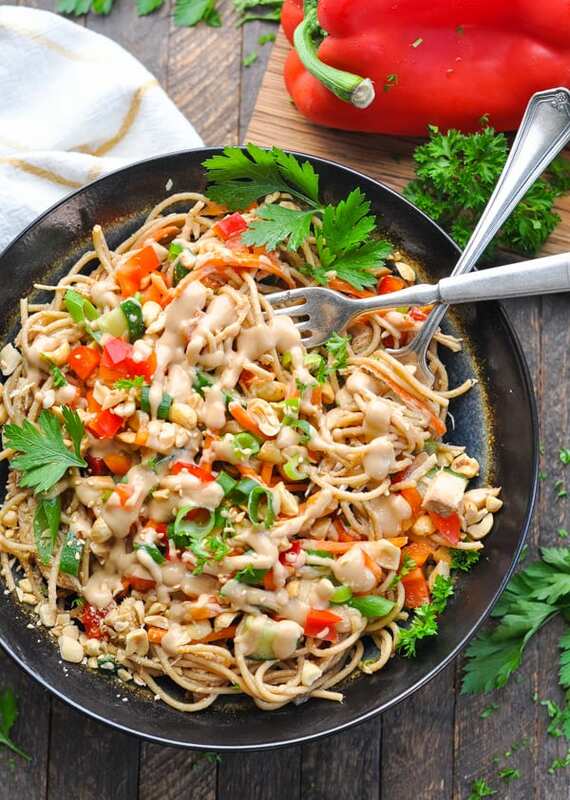 Just before serving, garnish noodles with chopped peanuts and toss or drizzle with additional sauce. Tip: I like to boil the noodles in advance and keep them in a covered container in the refrigerator until I’m ready to assemble the salad. In order to prevent the noodles from sticking to each other, run them under cold water in a colander as soon as you drain them from the pot. This will rinse off a lot of the sticky starch. I also like to drizzle the noodles with a little bit of oil and give them a toss before stashing them in the refrigerator. Cooking Just for Two? Cut the ingredients in half! The instructions remain the same. 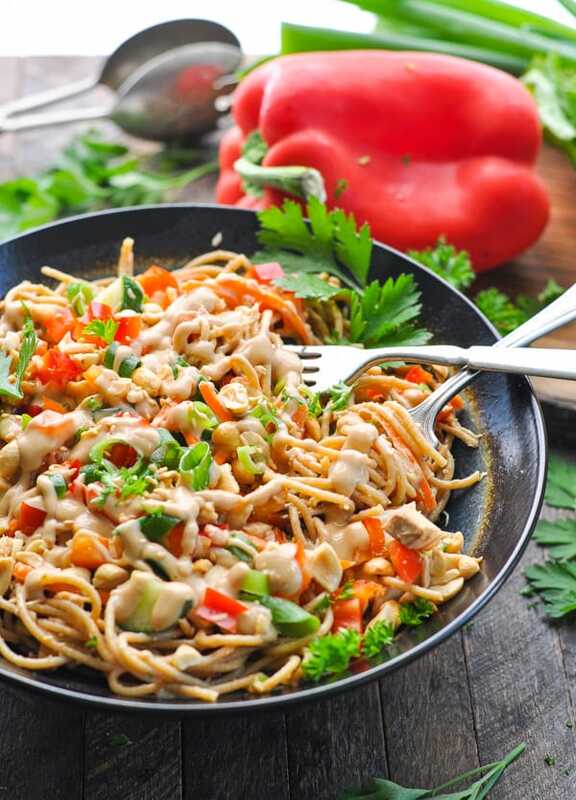 I have never tried a cold noodle salad before so I am excited to try this one. It looks delicious! Hi Karen! This is definitely one of our all-time favorites. I hope that you get a chance to try it! I just made this for dinner, oh my goodness it was SO, so good! My hubby and I both had seconds… the only thing I did differently was I served it warm!! I didn’t warm up the sauce, but I poured it over the hot noodles. I also cooked the mushrooms in some oil. We will be making this again, thanks! Hi, Carrie! That’s so great! I’m glad that you all liked it. I’ll have to try it warm this fall when cold pasta salads aren’t nearly as appealing. Thanks for the suggestion! Just made this and the sauce is very salty! and it did not come out like your picture. very runny, all i tatste is the soy sauce but i followed the directions to a T. any advice? it sounds delicious and i’d love to try it! Hi, Desiree! I have no idea why it would be so runny or salty. I use less-sodium soy sauce…is that what you typically use at home? Also, what kind of peanut butter are you using? I used Jif peanut butter, which is thicker than an all-natural peanut butter (the all natural peanut butters tend to be runny, so that might account for some of the thinner texture?). To thicken the sauce, I would try adding more peanut butter (if you have a thick peanut butter). See how that tastes and if you can get it to the desired consistency. You may want to add more seasoning (garlic, ginger, honey, etc) once you get it to the right thickness. Hope that helps!